I imagine most that read my blog are facebook friends with me. Tanner came up with some fun voices for the characters in a book we checked out from the library and it was quite a hoot. 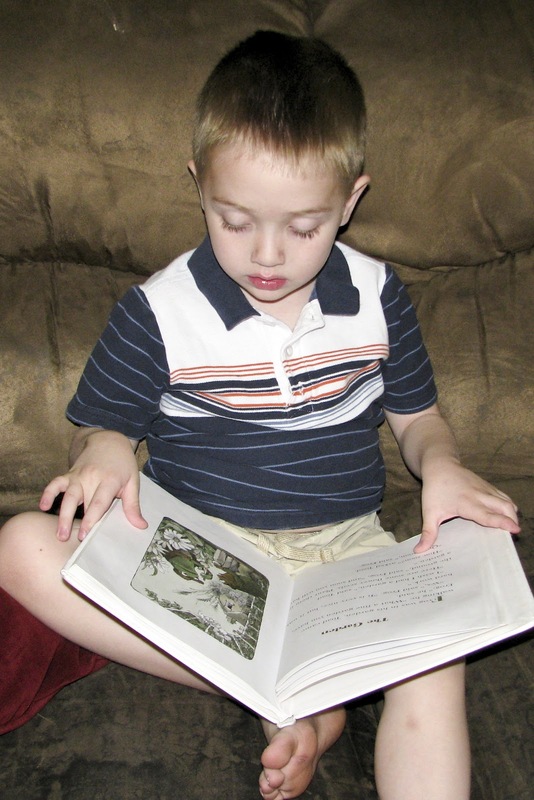 He is becoming quite the little reader and the voices spice it up a bit for me since I make him and Vance read to me for 15 minutes a piece each day. Vance's last day of school was on Friday. Wow. 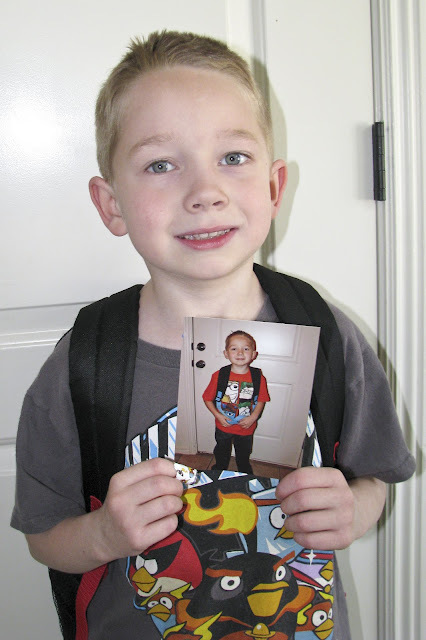 I took a picture of him holding a picture I took of him his first day of school. That was fun. I guess next time I should get a bigger print than a 4x6 since you can't really see him in the picture he is holding, but it was a fun idea I saw floating around Pinterest. Vance has learned a lot this year and we really enjoyed his the teacher he had. Saturday was a normal walk to the library and park day. We decided to do it in the morning before it got too hot and I am glad it did since he was in the upper 80's in the afternoon. 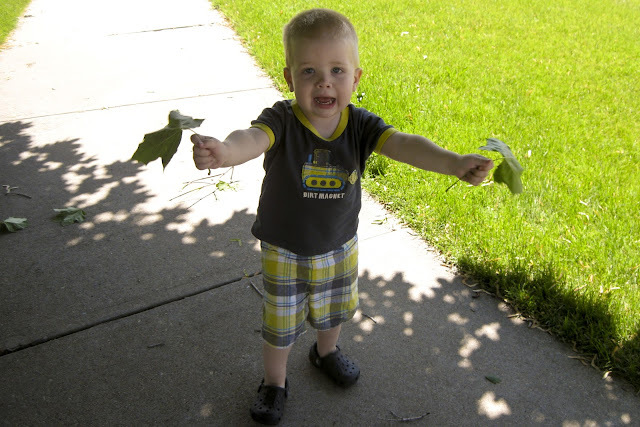 Porter had fun at the park playing with leaves. 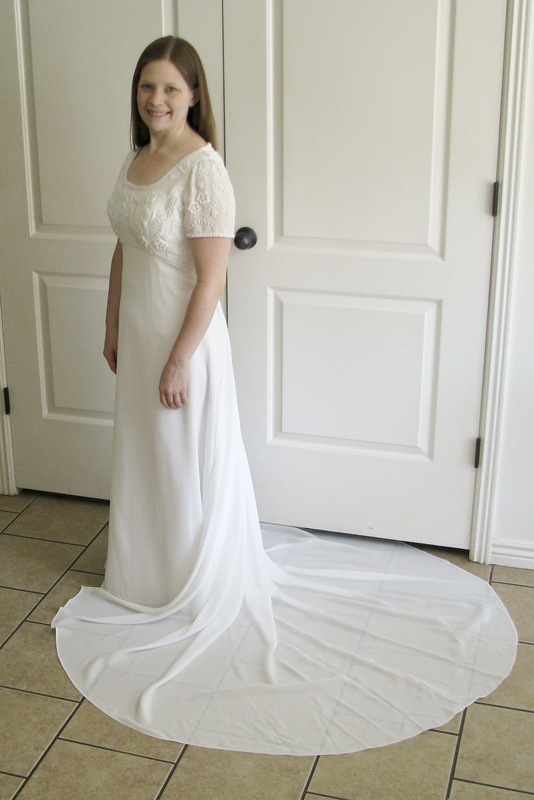 Stephen and I have been married for nearly nine years and I thought since I weigh what I did when we got married I would try on my wedding dress before slipping on my dress for church this morning. Vance and Tanner wanted to know why I was wearing that kind of dress to church and I had to point out that it was my wedding dress. I can't say it "still" fits because after having 3 kids I have no doubt there have been plenty of times when I couldn't fit into it, but it does fit again. Yay!